Origin Computers recently rolled out their 24GB RAM, high powerful Gaming Laptop, named Origin EON17 for its extreme game lovers.The all new Origin EON17 Laptop includes a Intel Core i7 family processor and is available for a price tag that starts at $2,499. The all new Origin EON17 Gaming Laptop comes equipped with a 17.3-inch Full HD widescreen display with resolution of 1920 x 1080 pixel with 16.9 aspect ratio and is housed with a top end highly powerful Intel Core i7 980X desktop quad-core or hexa-core processors.The gaming laptop packed with up to Dual NVIDIA GeForce GTX 480M graphics cards in SLI. New Origin EON17 Gaming Laptop supports up to 24GB of Triple Channel DDR3 RAM module and up to three HDD with a total 1TB capacity or up to 512GB SSD.Origin EON17 Laptop also Features multi-gesture touchpad, 7.1 HD audio system with five speakers and a subwoofer, instant access buttons and a full size keyboard with a numeric pad. Origin EON17 laptop will be available pre-loaded with Windows 7 Home Premium, Professional or Ultimate (64bit) options.Other Features includes DVD or Blu-ray drive, 9-in-1 card reader, HDMI in/out, DVI out and for power option an 88.8WHr battery. 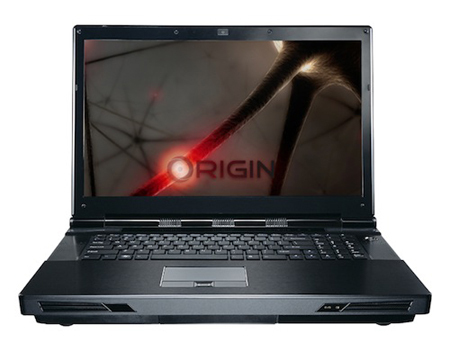 Tags:-Origin EON17 Gaming Laptop Features, Origin EON17 Gaming Laptop specs, Origin EON17 Gaming Laptop price tag, Origin EON17 Gaming Laptop memory, Origin EON17 Gaming Laptop processor, Origin EON17 Gaming Laptop graphics, Origin EON17 Gaming Laptop Ram, 24GB RAM Gaming Laptop, Intel Core i7 Gaming Laptop.